By all measures economists use to assess the quality of life a place offers—job availability, cost of living, commute times, recreation, etc.—Wisconsin stacks up pretty well. Very well, in fact. Problem is, people don’t consult economists when choosing the best place to pursue their passions. As CEO of NEWaukee, I devote my professional life and much of my personal life to promoting Milwaukee and Wisconsin as a career and lifestyle destination. My pitch has very little to do with the metrics you find in national rankings of “best places to live” and everything to do with what it feels like to call a place home. Instead, the marketing we do is much more experiential. And it works. I don’t know how many times I’ve heard of a place referred to as a “well-kept secret.” Really? If a place is truly awesome, word will spread, especially in today’s social media age. Granted, achieving national awareness of your city, region or state is challenging, but you need to ask yourself if such attention is actually warranted. In Wisconsin, we too tell ourselves that life is good here. And we have data to back it up. For example, 85 percent of all UW System graduates remain in Wisconsin after they leave school and 60 percent of all college graduates now living in Wisconsin were also born here, the eighth highest percentage in the nation. So, clearly, there’s something that keeps people here. It is, after all, a beautiful state with plenty to do. Nonetheless, there are so many ways in which our state could be even better, and I can’t help but worry that we suffer from a feedback loop in which we talk ourselves in circles about how great we’ve got it while the rest of the world moves on about their business, leaving Wisconsin behind. I’ve made it my life’s mission to change this place for the better, leveraging national and international placemaking’s best practices. I am not from here, and candidly, I didn’t pick Wisconsin. It picked me. I grew up with a set of parents who were from the southside of Milwaukee. Salt of the earth type folks who often found the coldness of the Californian culture disconcerting. Wisconsin was referred to as “home” in our house throughout my childhood, but it looked nothing like the home I knew in the Bay Area. We visited Milwaukee during hot, sticky summers and attended the Wisconsin State Fair, where I have distinct memories of eating cream puffs and watching a calf being born. Cut to a visit with my empty-nester parents in Milwaukee nine years ago. I was working in Athens, Greece, reveling in the freedom of a life as a young expat in a mega metropolitan area and the ability to order takeout at all hours of the night. Milwaukee was comparatively small and quaint, and never a real option for me, given my restlessness. Or, so I thought. During that visit, I attended a party hosted by my future business partner and was totally swept away by the energy of the young people in Milwaukee. The inklings of a new kind of networking organization was being explored by a group of friends that were eager to meet others their age interested in both exploring and shaping the city. I was impressed and humbled by the group’s combination of altruism and creativity and ended up dropping everything—my life in Athens and my fledgling career as an international journalist—to figure out what this “thing” could actually be. Even before we knew where we were going, we knew what we were doing would change things. We envisioned a future in which people connected in new ways—with one another, with the city, with a future job or a future spouse. The momentum was intoxicating, and it seemed like nothing could stop us. This “thing” became NEWaukee, a social architecture firm whose mission is to realize Milwaukee’s full potential and to empower its citizens to shape the city’s future in fulfillment of their inclusive vision. Mine is not an overnight success story (is there such a thing?). In the last decade, I have founded three businesses, all before the age of 30. Two have failed, but added to my confidence and resilience in taking the path less traveled. Living here allowed me to get to the point. To get to the good stuff—a phase of my life that others spend years working for and often never achieve: the freedom to pursue my true passion. Unlike my peers who opted for big, coastal cities, I could afford to start a business at age 23, and do so again, and then again. I could afford to buy a house at age 26. I could afford to continue my travels—one of the best parts about being in the middle of the country is that you can go to either coast with relative ease and no long-haul flights. While Wisconsin offers countless individual perks to its residents, the state is truly greater than the sum of its parts. Because I wasn’t living paycheck to paycheck, I was able to devote all of that spare energy and time into making this a better place. And that is why Wisconsin is an incredible place for millennials. Of all the stereotypes about my generation, the one I can attest to is our deep desire to contribute to the greater good. In Wisconsin, you have the time, space and support system to discover your passion, and to make it happen. Yes, but is it scalable? I have seen my experience in Wisconsin replicated over and over again across the state. And that same fervor that fueled the formation of NEWaukee has sparked similar social engagement throughout Wisconsin, most visibly in YPWeek. YPWeek is a week-long conference of discovery, adventure and conversations about the issues that matter among young professionals in Wisconsin. YPWeek brings together community leaders in purposefully chosen locations representing unique cultural assets for meaningful learning and social interaction. This year, YPWeek included nearly 30 communities throughout Wisconsin. Hundreds of events were designed to leverage the perspectives young professionals bring to their communities and workplaces as Wisconsin seeks to maintain and grow its talented workforce and foster its exceptional quality of life. Through collaboration with dozens of partners from across the state, we have created the nation’s largest and strongest statewide network of young professionals. NEWaukee is a small and nimble team fortunate to have found soulmates across Wisconsin who share our dedication to the state’s future. Together, we have moved mountains, devoting time, sweat, and in some cases our own personal resources to bring YPWeek to life in Wisconsin. In the process, we have set Wisconsin apart from any other location in terms of fulfilling millennials’ desire to shape their communities. There’s still plenty to do here in Wisconsin, and we welcome everyone eager to roll up their sleeves, get their hands dirty and make a difference. Angela Damiani is a serial entrepreneur and currently the co-founder and CEO of NEWaukee, her third venture. 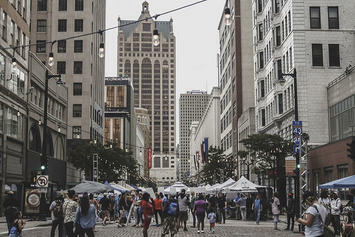 NEWaukee is a social architecture firm that specializes in community-based signature experiences centered on high-profile issues of importance for the state of Wisconsin. NEWaukee also provides consumer, employer brand and talent engagement services to employers looking to attract and retain talent necessary to grow their businesses. For more information about NEWaukee, please visit: www.newaukee.com.